Siberian Huskies, are without a doubt, one of the most beautiful breeds that have ever graced the grounds of this Earth. They are one of the most energetic and graceful dog breeds out there. In addition to those beautiful pairs of blue eyes and impressive wolf-like structure, the Siberian Huskies are also equipped with brains, intellect and intelligence. But in this article, let’s talk about the Husky puppies. Siberian puppies are in an entire league of their own. It goes without saying that puppies have an entirely different set of needs but more so with Husky puppies. They eat far less than most breeds but are also pickier than most breeds which makes feeding them a bit of a challenge. But you can now start easing up, because in this article, I have rounded off 5 best husky puppy food. 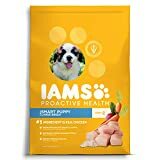 First up on the list, we have the Puppy Dry Dog Food brought to you by IAMS Proactive Health. 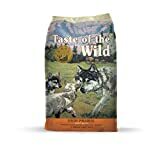 I consider this as one of my best picks mainly because it is made with a formula that has been specifically designed to cater to the needs of your husky puppy’s first two years. It does this with its quality sources of protein which include both chicken and egg. This ensures that your dog will be provided with enough foundation for the building blocks of protein. In addition to that, this puppy food also comes with fats, mainly in the form of omega 3 which helps in the development of brain and helps ensure that your eye will not develop any eye problems, as much as possible. Aside from being rich in protein, this food is also enriched with different minerals and vitamins which makes sure that your puppy’s immune system will be properly taken care of. Next up, we have the Wellness Complete Health Natural. This puppy food is a hundred percent natural and organic which is the reason why this puppy food is one of my top choices. It is very rich in different ingredients that are all essential in the growth of your puppy during the first two years of his or her growth. Some of these ingredients include deboned chicken, salmon and oatmeal. All of the aforementioned ingredients are good sources of lean meat, minerals such as calcium, and organic and healthy carbs. 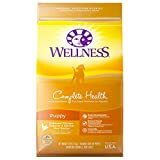 In addition to this, this puppy food comes with no possible or potential allergens such as grains, artificial coloring elements, fillers or by products. Just like the previous item, this one is also no stranger to omega 3. To ensure that your puppy’s brain will develop healthily during its earliest stages, this dog food is enriched with omega 3. This, too, helps in the maintenance of your dog’s skin and coat. Third, we got Purina Pro Plan. One of the things I really appreciated about this dog food supplement is that it comes with carefully curated set of ingredients that are all targeted at the development of your puppy’s brain, bones and as well as the health of your puppy’s eye or vision. First of all, this dog food contains fish oil which is a very good source of omega fatty acids which are all good at helping with the health of your puppy’s hair and brain development. Furthermore, this puppy food also contains elements such as glucosamine that help with the physical growth of your puppy such as with the growth of your puppy’s joints. Glucosamine also ensures that your puppy will not have any joint conditions in the future. However, this contains corn so if your dog is allergic to corn this might not be that much of a good idea. Next up, we got Hill’s Science. Huskies are of course big sized breeds. That being said, one of the things I appreciated about this food supplement is that it is made with a formula specifically designed to target the specific health and diet needs of a dog of a large breed. This dog food is enriched with minerals, vitamins as well as amino acids. In addition to this, this dog food also has a reputation for making sure that your puppy’s coat will stay healthy and shiny. Aside from the maintenance of the cost, this one is also reputable for raising the energy levels of your puppy. Last but most definitely not the least, we got the Taste of the Wild Puppy Formula. This puppy food has been made with a formula that is absolutely free from grains which is a common allergen among some dogs. Another good thing about this supplement is the taste which your pup will surely appreciate, as well. In addition to this, this one also boasts of essential nutrients such as antioxidants, vitamins and minerals that come from healthy ingredients such ss smoked salmon and roasted bison. These ingredients are also the ones responsible for the good taste of the supplement. In addition to being tasty, this good is also reputable for an increase in the energy levels of puppy. Both of these food groups or element group play a key role in the growth of your Siberian Husky puppies. Let us first talk about minerals. One of the most essential minerals you have to make sure your puppy is getting would be calcium. This is very crucial and for this reason, from the moment that you separate the puppy from the mother which is typically around three months after he or she has been born, you have to make sure he or she is getting enough amount of calcium supplements. There are a lot of sources that can give you this mineral. There are dairy products such as cheese or even yoghurt. In addition to that, we also have fish food products. Examples of these are salmon and tuna. All of these are very good sources of calcium plus an entire wave of other vitamins and minerals; just make sure they are organic. Next is protein. Now, protein is of course a food group you cannot just skip. However, feeding your dog protein comes with a set of rules you have to observe closely. Keep in mind the three types of meat which are turkey, chicken and beef. These three are your best bets when it comes to feeding your dog meat. When it comes to feeding him or her pork, however, there are certain points and keys you must take note. If you do opt to feed your dog some pork, keep in mind that you must at least include about a third of thermally processed lean meat. In addition to being, thermally processed, it also has to be minced. The rest of the combo must be composed of minced offal. But always keep in mind that your meat servings always have to be balanced with a mixed amount of both offal and lean meat. Third, we have carbohydrates. It does not even come as a surprise that carbs must be included in your husky puppy’s diet considering how lively, playful and energetic they are. Carbs are a good way to make sure that your puppies are always filled with energy and spirit. Carbs are very easy to digest, especially from your puppy’s small intestine. These carbs also offer heat once it has started to metabolize. In order for your puppy to get the best of results, go look for carbs that come from healthy and organic sources such as whole grains. This is because, with whole grains, you get a source of fiber that helps and aids with your puppy’s digestive health. The most essential benefit of eating fats for your dog is that their coat and hair starts to drip in shine. Fats are a good way of making sure that your dog will maintain a healthy coat, hair and skin. For best results, always try to look for dog food that contains omega 3 and omega 6. The same thing goes for when your husky puppy finally grows out to be an amazing adult siberian husky. The number one target of this condition is your puppy’s skin. Now, this disease can affect dogs in usually three ways but for husky puppies or dogs, it affects the coat. This happens when no matter how much zinc your puppy is consuming, it still shows signs of deficiency in zinc. This means your puppy is not absorbing the nutrient zinc inside his or her body. Signs of this include dull and dry coat and scaly skin lesions. To address this, make sure you get supplements that are plant-based antioxidants. Next, we have an eye condition. To be specific, it is the Progressive Retinal Atrophy. You may want to be extra cautious if your husky puppy possesses the male gender because this condition, more often than not, affects the male population of huskies more. This condition is characterized by being blind at night brought about by the deactivation of photoreceptors. In order for you to address this eye issue, make sure that your puppy is getting enough vitamins and other antioxidants. Just like the second health issue previously mentioned, Cataracts are an eye problem, as well. In fact, this eye condition is actually associated with the late stages of Progressive Retinal Atrophy. Cataracts are characterized by the opacity of any lens. While it is painless, it can lead to a serious damage to the eye. Specifically, it could less to permanent loss of vision. Usually, Cataracts are inherited and typically affects the back lenses of your puppies. But if course, there are ways for you to address this. Just make sure that your husky puppy is getting enough amount of vitamins and minerals from supplements. And the best husky puppy food is the Purina Pro Plan Focus Puppy Dry Dog Food. 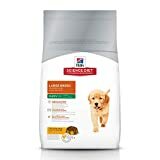 You certainly cannot go wrong with a puppy dog food that utilizes a formula which has been specifically designed to address the needs of a growing puppy that is of a large sized breed. With that being said, this puppy dog food cannot be any more ideal for your husky puppies. With ingredients such as fish oil that will supplement your puppy with the necessary minerals such as calcium and ingredients such as chicken for protein, this puppy food is certainly the best.